Vanila essence - 1/2 tsp. Baking powder - 1/2 tsp. Beat the eggs well, add sugar and again beat well, till it becomes fluffy. Sift flour,coco powder, and baking powder together, and set aside. Add this mixed powder little by little into the egg-sugar mixture, and add the pinch of salt. Mix the whole things together and beat well on high speed till it triples in volume and cool. Pour batter into a 20 cm cake pan. Bake in a preheated oven at 180° for 15 to 20 minutes. Allow to cool on a wire mesh. Make a solution of 50 G. sugar and 1 tb.spoon water. 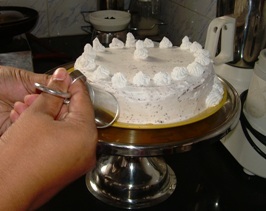 Pour the sugar solution on top and around the cake. Sandwitch the cake with layers of creme, and decorate it with chocolate shavings and cherry. Those who want can add 30 ml. rum to the mixture. 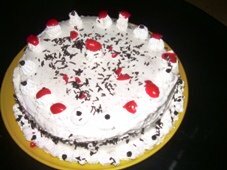 Those who want more coco in the cake can add more coco powder and reduce quantity of maida.